Thursday seems to be a bad day for me. I blame it on the explosions of brilliance on the first three days of the working week that leave me exhausted, but it may just be coincidence that Thursdays rarely find me with anything to say. Whatever the reason, here I am on yet another Thursday, with quite a few news articles to choose from but nothing really grabbing me. 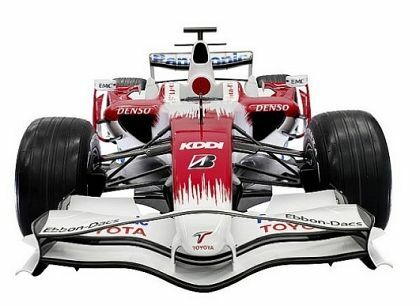 So Toyota have launched their car for 2008? I'm sure we're all highly excited about that. Force India have finally decided that their rumored choice of drivers was correct and that makes it old news. It's great that Liuzzi has managed to hang on to F1 as a test driver but, if only they'd put Ralf in the second race seat, I might have something to get my teeth into. Honda are being coy about their car's new livery, Alex Wurz will be Honda's test driver (good!) and various experts give their opinions on this or that. It all seems much of a muchness and it is Thursday, after all. So I get to thinking about how I can avoid the dreaded postless day. The standard answer in the blogosphere is to get you, the reader, to supply something and I'm happy to give that a go. If any of you have something you'd really like to say but couldn't be bothered setting up a blog to say it, write it all down and I'll post it. Be warned, however: I am a fierce editor and might change things around a bit. But the sense will remain the same, I assure you. What better way to hone your writing skills and let off a bit of steam at the same time? And, believe me, we all need a bit of honing when it comes to writing skills - practice does not make perfect but it certainly improves. Funnily enough, the one article that did stir me a little this morning appears on PitPass. It is an excellent example of poor journalism and we could use it as illustration of some of the pitfalls to be avoided. Entitled The 6th of January, it relates a long story of failing to get an autograph, only to succeed forty years later. But it is really about an incident between Denny Hulme (a New Zealander driver who made it) and Laurence Brownlie (one who didn't) during the 1968 New Zealand International Grand Prix. The problem is that we are never told exactly what happened to cause the bad feeling, only recently ended, between the two drivers. I read the entire thing hoping to discover the details of the incident but the writer must assume that we know them already - always a mistake. Even if well known, a quick summary of events will help to hold the interest of anyone who hasn't heard the news (or "olds" in this case). Otherwise the article consists of a string of names, some famous, some not so. This we could excuse, if only the main point of the story had been explained; as it is, it just looks like name-dropping. In the end, we don't care that the writer finally managed to get the autograph so curtly refused before. We can learn a few things from the article as a result. Most importantly, we need to decide on our main point, on which everything else will depend. Digressions are fine, if amusing or informative, but we need always to remember the essential idea and return to it as soon as possible. Never make lists of names that you know well but others may not have heard of. In fact, don't even mention the famous ones unless you have an original and vibrant memory of them. The only vaguely interesting thing mentioned about Chris Amon (a driver that I'd like to know more about) in the PitPass article is that he replied, "Good lord," to an email. Don't assume that the reader knows all the people and events brought into your writing; a brief explanation serves as a reminder to those who know and a lifeline to those who don't. I don't want this to be some sort of writing class (I don't believe in them anyway) but the article was just begging to be used as an example of how not to go about it. Don't be put off if I seem a little over-critical - it's my trade and so I'm bound to take an interest in how others go about it. And to return to the main point: as an experiment, I proclaim Thursday as Guest Writer Day and intend to sit back and watch the posts pour in. Get them to me by Wednesday evening (EST) and I'll do my best to publish them the next day. Who knows? I might be about to discover some budding authors and to set some on the course to great things. Throw your posts at clive.allen@gmail.com and I should get them. Go on, give it a try. Not a topic that can be fleshed out, but Toyota seem to be proving your theory of "if there is not a picture their hiding something." (your words not mine: ). Where as we saw very few detailed pictures of the expected front runners, Toyota was nice enough to give us a close up of their entire rear end..... The back of the car is the one part that is easily hidden and also contains most of the innovative parts (assuming there are any).....I guess its not like teams are spying on the Toyota design. There was one major innovation they showed off today. They have changed the base color of the car from white.... to pearl! The performance benefits are undeniable, soon all F1 cars will be sporting Toyota colors...... Then we can really talk about a bland and boring race. Just by the laws of chance, sooner or later Toyota have to get it right. Don't they...? So write me some articles, Dan! Well, I read that article & I still haven't a clue what it was about - or what the point of it was ! But it was news to me that there was ever a GP in NZ - must have been way before my time, so I did learn something from it afterall. I'd love to contribute an article, but I don't have any particularly singular F1 experiences. David Richards officially declares Prodrive as dead. What a shame. Now, perhaps Max can open up the 12th slot again to applicants? Ollie had it as well, Journeyer, but only after I had posted today. Even so, I'm not sure that it would have galvanised me today - it's been a typically jaundiced Thursday and I might have had little to say but, "What else is new?" I think we all saw it coming, after all. Max has already indicated that the slot is open again. When Dave Richards asked him whether it would be okay to enter next year, Max replied that it would, but Prodrive would have to pass the criteria all over again. It's no wonder Dave has become fed up with the whole business. Good point, Clive. Besides, he can always go back to WRC. His life is much, much easier there (notwithstanding the fact that there are only 2 major manufacturers there right now, with everyone else basically becoming B-teams).